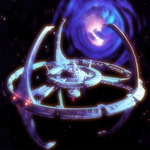 This is the thread for recommending stories written for Star Trek Deep Space Nine. I just love this series, and totally miss it since it ended when I was in college, many moons ago. So now I read fan fiction which manages to renew my love for the amazing story lines and unforgettable characters from the original show. I guess I get to do the honors by recommending the first stories for this thread. I think that's it for me, for now. Feel free to post your own favorite stories too. Awww thank you for including me. ^ Thanks for the fic rec. I will definitely check out that story.